I immediately knew something serious had happened…my lady doesn’t comment on broken stuff unless it’s well and truly broken. The last time she came to me saying that something was broken was when the vacuum cleaner motor shot ball bearings across the room with enough force to penetrate sheet-rock. Just to be perfectly clear it then followed up with a rather spectacular jet of hot blue plasma burning right through the metal and plastic on the top of the machine and slicing the bag open like a cutting torch would. So…the dryer won’t dry. What’s up? The house is still standing so I figure it can’t be that serious…though I already know (since it involves appliances and/or home improvement/repair) that it’s going to be expensive. I assume my “manly man” role, scratch myself inappropriately, and check it out (translation: I turned it on). Diagnoses: Heater heating. Tumbler tumbling. Machine isn’t launching itself into the attic or through a wall. Death and destruction at a bare minimum. No plasma anywhere. Can’t be much else besides a clogged vent. Now…this is at the suburban “blah” house…and while it looks pretty nice, most everything they did in that house was for looks alone. Longevity, serviceability, decent design principles…all tossed out the window in an effort to make a very nice looking house…as cheaply as possible. The laundry room is a prime example…looks great…but is not on an outside wall so the dryer vent goes straight up…15 feet…and out the roof. Because of the arrangement of the door and plumbing…in order to tinker on EITHER machine…they both have to be completely removed from the room. So…pulled the door…the washer…then the dryer just so I could get to the duct connection. 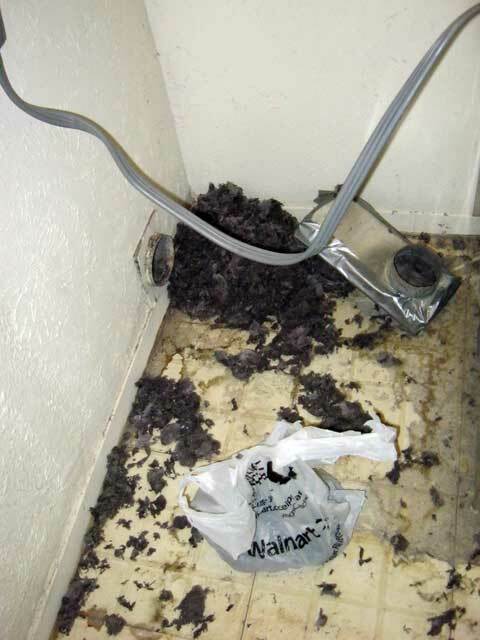 I found about what I expected…lint collection on the inside of the up-pipe had eventually gotten thick enough that some of it collapsed to the bottom of the stack, clogging the vent. I fished it out. Then went one better and stuck my hand up the duct as far as I could…VERY fuzzy…which is not the most pleasant thing to find when you’re sticking your hand up something as far as you can. So…off to the homeowner hell store I go…and I buy a brush to clean it out…a 4″ brush with 12 feet of flexible fiberglass rods to run it up the duct while spinning it with a drill. I also bought the extender kit (12 more feet of rods) because I knew my duct was longer than the basic kit would reach. Oh…yeah…I ALSO bought a new drill…since I burned up my light duty cord drill working on my sister’s house…and all my heavy or battery drills are hanging out at the Old Vic. Another $40. Sigh. Hmmm…new hoses for the washing machine are in order too…since they are probably 20 years old. May as well since I have to uninstall that machine just to get to the back of the dryer. So…$30 more. Ugh. Definitely preferable to a massive destructive tidal wave accompanied by the wife’s calm, “Honey, the washing machine is leaking.” that would probably occur if I didn’t change the old hoses. So…the result of my hunt for a brush is the product in the picture above. What do ya think? Deal or dud? Would the product work? Or was it a waste of $50 or so? ($35 for the basic kit, $15 or so more for the extension kit). VERY effective product. 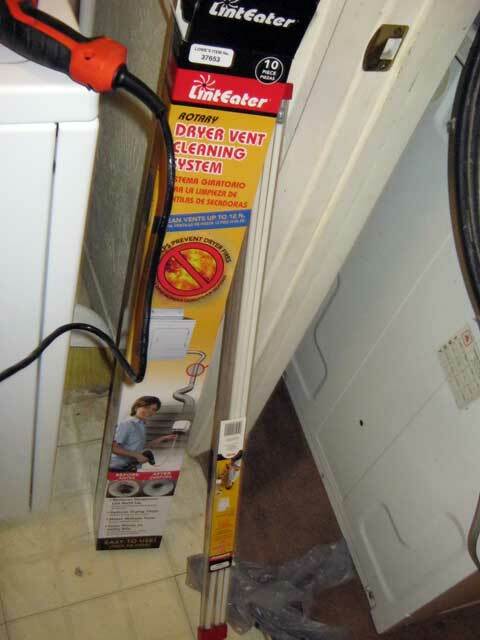 Easy to use…the rods are VERY flexible and easily went up the stack despite the outlet being down against the floor. Attach brush to rod, attach rod to drill, run up and down a few times, drag out the lint, run it back up, detach drill, add the next length of rod, reattach the drill, run it up and down a bit…and so on. Inside of the pipe is smooth/clean and I got 5 more piles of lint that size out of the stack. Brush and rods are still in good condition and ready for another go. Well worth the funds. It’s a pleasure to actually buy something that does as promised. 5 Responses to Deal or Dud? Well at least is is an overall straight run. Had a house built in 2000 that had the most twisted dryer vent I have ever seen. No less than nine 90 degree turns in the vent before it made it to the outside wall. I tried the brush options but it would go about three turns then get stuck. So I resorted to a different tactic, the shop vac. Stuck that in the hole and sucked out part of the mess but felt I could do better, so upgrade. Electric Blower! Queue Tim the Toolman grunting, jammed the end of that in the hole, took the outside cover off and cranked things up. Poor neighbour must have wondered what hit the side of his house. There was a huge ball of lint in the yard that had shot out of the vent and hit his house leaving quite the mess. But that vent was nice and clean. My line is about 25′ long with 2 90’s in it. Fortunately it is horizontal and I can attack it from each end and overlap in the middle. We possibly do a few more loads of laundry per week than you do; but I have learned not to overlook the clean out. If we go more than 18-24 months without cleaning the laundress (my better half!!!) starts commenting that she smells something burning. P.S. What happened to “Roofage is imminent”? Inquiring (nosy?) minds want to know. And we expect pictures! Roofage is still waiting on a weather window…they want 5 days.